"Providing patronage to the transforming sports since centuries"
For the second consecutive year in 2007, HRH Group of Hotels on the day of the finals at the Amity Polo Cup for Charity hosted the exhibition match titled, Eternal Mewar Cup. Its association with polo and polo-ponies goes back a long way. 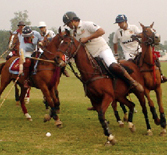 Polo has been patronised by the House of Mewar in India and the UK, where the ‘Udaipur Cup’ has been sponsored at the Cambridge and Newmarket Polo Club. Udaipur itself has a glorious tradition of horsesports as part of its royal heritage. Financial assistance is also conferred towards the Promotion of Games and Sports. For example, in the month of April 1999, two National level Cricket players received financial assistance towards their tour of England and Scotland. This will also benefit and promote cricket in the erstwhile Mewar area. 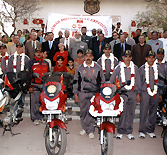 MMCF welcomed 'Frozen Dunes to Sand Dunes' - Mewar Motorcycle Expedition of 9 Grenadiers (Mewar) at The City Palace, Udaipur on 23rd December 2006. MMPS students regularly participate at State Level in swimming, table tennis, lawn tennis, cricket and badminton. Maharana Mewar Public School students exhibited excellent performance in the 49th District level games and sports organised by Education Department, Govt. of Rajasthan (Swimming, Badminton, Lawn Tennis, Table Tennis, Cricket). A trekking expedition was organised at Sajjan Garh Reserve Forest. 32 students of Maharana Mewar Public School were selected in various sports competitions at State as well as National level. District Chess Federation and Ladji Institution had organised a Chess Competition at Central Public School, Udaipur in which MMPS students participated and bagged prizes. JSU Heritage International Rating Open Chess Tournament was organised by the All Rajputana Chess Association at Jaipur in which Maharana Mewar Public School students participated and won prizes.A scholarship of Rs 6600 was awarded to Maharana Mewar Public School students for State Championship in Swimming. Maharana Mewar Public School students participated in the CBSE West Zone Chess Championship and bagged prizes. The business and charitable organisations under Eternal Mewar continuously engage in sports activities and seek like minded organizations to partner such activities.